LEBANON, Ohio – January 19, 2015 – Doran Racing is pleased to announce that it will field two Nissans in the IMSA Continental Tire SportsCar Challenge series in 2015, beginning with the season opener Friday at Daytona International Speedway in Daytona Beach, Fla. Fan favorites Brad Jaeger of Charlottesville, Va. and B.J. Zacharias of Cincinnati return to the #14 Nissan 370Z, while Nissan GT Academy standouts Bryan Heitkotter of Fresno, Calif. and Nick McMillen of Salem, Ore., will share the #41 Nissan 370Z. 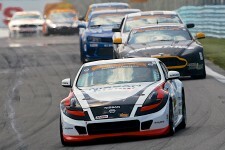 Jaeger and Zacharias were in the heat of the action up front in nearly all 12 CTSCC races last year. The veterans’ Nissan finished fifth in the final point standings for 2014 with two podium finishes (Sebring and Watkins Glen) and two additional top-five finishes (Laguna Seca and Indianapolis). “I’m really looking forward to a fresh start and a new year,” said Zacharias, who drove the first Nissan 370Z in Grand-Am competition 12 years ago. 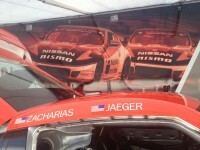 “I feel very fortunate to be back with Kevin Doran, Brad Jaeger and Nissan for the Continental Tire series. I think Brad and I really started becoming a threat last year as the season progressed. “The series has gone down to 10 rounds in 2015, so coming out of the gate full bore will be important,” Zacharias added. “Number one on the list is the championships that are up for grabs. The team has worked really hard over the winter to ensure we have a shot right from the first green flag. “Brad and I have kept steady communication throughout the off-season, so we know what to expect,” Zacharias added. “I think being paired back with him for another full season helps the 14 car in our push for the title. “I’m really excited to return to Doran Racing for the 2015 Continental Tire season,” said Jaeger, who is also pursuing a masters degree in business administration at the University of Virginia. “B.J. Zacharias and I had a great season last year driving the #14 Nissan 370Z, where we finished fifth in the championship, and I am looking forward to growing the program with Nissan this coming year. “B.J. and I work really well together, and I think everyone on the team started to find their ‘groove’ halfway through last season,” Jaeger continued. “If we can keep that momentum going into this season, we should have great results. “I’m also really happy to have two Nissan GT Academy drivers join our team in another 370Z,” he added. “I think Nissan’s GT Academy program is excellent at finding talented drivers, and Bryan and Nick will definitely help this year’s effort. The Nissan GT Academy is a reality TV show/program that takes top performers in racing video games and develops them into professional race car drivers. Heitkotter earned his spot in the Nissan GT Academy in 2011. He drove for Doran Racing in selected events in the CTSCC series in both 2012 and 2013 in a Nissan. Despite doing only partial seasons, he won two poles in 2012 (Mid-Ohio and Laguna Seca) and one in 2013 (Road America). He finished seventh in the Pirelli World Challenge Touring Car series last year driving a Nissan Altima Coupe for another Nissan-affiliated team. McMillen became a Nissan GT Academy driver in 2013. His 2014 season got off to a great start with a class victory at the 24-hour race in Dubai for Nissan. He went on to drive a Nissan in the Blancpain Endurance Series last year, and took home a victory at Silverstone, England enroute to a 15th-place finish in that series’ Pro-Am Cup point standings. This week’s schedule for the BMW Performance 200 at Daytona shows one-hour practice sessions on the 3.56-mile road course at 1:30 p.m. and 3:45 p.m. on Wednesday. There is a half-hour practice session slated for 11:45 a.m. on Thursday before qualifying for the Grand Sport class is held at 2:40 p.m. that afternoon. Race day, Friday, begins with a 20-minute warm-up session at 9:45 a.m. The green flag is slated to drop on the 2.5-hour race at 1:45 p.m.
A press time there were 25 GS entries and 32 Street Tuner entries for a field of 57. The CTSCC race supports the Rolex 24 on Saturday and Sunday. Doran Racing has won that race overall multiple times, and it has also won it as a car manufacturer. Live timing and scoring and live video coverage are slated for imsa.com. IMSA officials said the race will also be televised on Fox Sports on a date and time to be announced later. Jan. 23-25 Daytona Int’l Speedway, Daytona Beach, Fla.
March 20-21 Sebring Int’l Raceway, Sebring, Fla.
May 2-3 Mazda Raceway Laguna Seca, Salinas, Calif.
June 27-28 Watkins Glen Int’l, Watkins Glen, N.Y.
July 11-12 Canadian Tire Motorsport Park, Bowmanville, Ont. July 24-25 Lime Rock Park, Lakeville, Conn.
Aug. 8-9 Road America, Elkhart Lake, Wis.
Aug. 22-23 VIRginia Int’l Raceway, Alton, Va.
Oct. 2-3 Road Atlanta, Braselton, Ga.